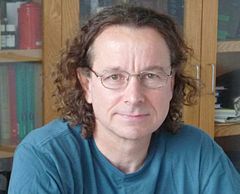 Roderick MacKinnon (born 19 February 1956) is a professor of Molecular Neurobiology and Biophysics at Rockefeller University who won the Nobel Prize in Chemistry together with Peter Agre in 2003 for his work on the structure and operation of ion channels. In 1989 he was appointed assistant professor at Harvard University where he studied the interaction of the potassium channel with a specific toxin derived from scorpion venom, acquainting himself with methods of protein purification and X-ray crystallography. In 1996 he moved to Rockefeller University as a professor and head of the Laboratory of Molecular Neurobiology and Biophysics where he started to work on the structure of the potassium channel. These channels are of particular importance to the nervous system and the heart and enable potassium ions to cross the cell membrane. Potassium channels demonstrate a seemingly counterintuitive activity: they permit the passage of potassium ions, whereas they do not allow the passage of the much smaller sodium ions. Before MacKinnon's work, the detailed molecular architecture of potassium channels and the exact means by which they conduct ions remained speculative. In 1998, despite barriers to the structural study of integral membrane proteins that had thwarted most attempts for decades, MacKinnon and colleagues determined the three-dimensional molecular structure of a potassium channel from an actinobacteria, Streptomyces lividans, utilizing X-ray crystallography. With this structure and other biochemical experiments, MacKinnon and colleagues were able to explain the exact mechanism by which potassium channel selectivity occurs. In 2007 he became a foreign member of the Royal Netherlands Academy of Arts and Sciences. MacKinnon is co-inventor with his friend and scientific collaborator, neurobiologist Bruce Bean of Harvard Medical School, of a dietary supplement for treating and preventing muscle cramps; they tested it in clinical trials and are co-founders a company to commercialize their invention, Flex Pharma. Christoph Westphal and Jennifer Cermak were co-founders as well. The company undertook drug development of a formulation of supplement as a drug candidate for neuromuscular disorders like ALS, and raised a $40 million Series A round. The company had a $86 million initial public offering in 2015. In 2016, the company launched "HotShot" as a dietary supplement for endurance athletes. In June 2018 the company halted clinical development of the drug candidate due to tolerability issues, cut its workforce, and said it was considering its strategy. In July 2018 MacKinnon resigned from the board of directors. ^ "2003 Nobel Prize in Chemistry Awarded to Researcher Roderick MacKinnon". Brookhaven National Labs. October 8, 2003. Retrieved 11 February 2010. ^ "Nobel Prize honors Rockefeller University scientist Roderick MacKinnon for revealing process of electrical signaling in humans and other living organisms". The Rockefeller University. October 8, 2003. Retrieved 20 April 2018. ^ a b Birmingham K (June 2001). "Rod MacKinnon". Nat. Med. 7 (6): 648. doi:10.1038/89005. PMID 11385491. ^ MacKinnon R, Cohen SL, Kuo A, Lee A, Chait BT (April 1998). "Structural conservation in prokaryotic and eukaryotic potassium channels". Science. 280 (5360): 106–9. Bibcode:1998Sci...280..106M. doi:10.1126/science.280.5360.106. PMID 9525854. ^ Doyle DA, Morais Cabral J, Pfuetzner RA, et al. (April 1998). "The structure of the potassium channel: molecular basis of K+ conduction and selectivity". Science. 280 (5360): 69–77. Bibcode:1998Sci...280...69D. doi:10.1126/science.280.5360.69. PMID 9525859. ^ "The Chemistry of the Cell". Brookhaven National Lab. Retrieved 13 March 2010. ^ "R. MacKinnon". Royal Netherlands Academy of Arts and Sciences. Archived from the original on 13 February 2016. Retrieved 13 February 2016. ^ "A Scientific Solution to (Finally) Stop Muscle Cramps". Outside. 1 September 2015. Retrieved 20 July 2016. ^ a b Fidler, Ben (9 September 2014). "To Fight Cramps, Christoph Westphal Taps Boston All-Stars for $40M". Xconomy. ^ Carroll, John (September 8, 2014). "Christoph Westphal launches another biotech, with the help of some wealthy friends". FierceBiotech. ^ Garde, Damian (28 January 2015). "Flex Pharma pulls off an $86M IPO for its cramp-treating spice cocktail". Fierce Biotech. Retrieved 20 July 2016. ^ "Fuel Buzz: New HotShot Drink Aimed at Preventing Cramps". Competitor. 2 June 2016. Retrieved 20 July 2016. ^ Al Idrus, Amirah (June 13, 2018). "Flex Pharma dumps midstage trials, cuts workforce, mulls a sale to stay alive". FierceBiotech. ^ "10Q Quarterly Report". www.sec.gov. Flex via SEC Edgar. 1 August 2018. ^ "Form 8K". Flex via SEC Edgar. 25 July 2018. This page was last edited on 3 October 2018, at 09:37 (UTC).